The Octocorals contain some of the most varied forms and some of the most vividly colored animals in the sea! The Octocorals are a fascinating group of animals. This group contains the non reef-building corals belonging in the subclass Octocorallia. Being softer, more flexible animals than the hard corals or stony corals, they are loosely referred to as "soft corals". However, like stony corals they can take many forms including branching, encrusting, whip-like, feather-like, fleshy and even a few that have calcareous structures. There are many animals in the Subclass Octocorallia. They are quite numerous throughout the waters of the world numbering at about 3000 known species. Octocorals are found primarily on inner reefs at depths just below the stony corals where there is gentler water motion. They are not usually the dominant coral on many areas of the reef, but they can be in areas where there is a lot of sediment. The Octocorallia subclass includes many well-known beginner aquarium Soft Corals and Leather Corals. Others are the beautiful Gorgonians or Horn Corals, known as Sea Fans and Sea Whips. There are also very unique Octocorals like the Blue Coral, the Mat Polyps which include the Organ Pipe Corals and Green Star Polyps, and the Sea Pens too. Best known Soft Corals, including the Leather Corals and the Gorgonians. The Bushy Sea Rod is a more aquarium friendly gorgonian that should be housed in a tank that is at least 100 gallons. The lack of light in this video is to help the gorgonian adjust. They grow to over 3 feet (1 meter) and need straight moderate water flow, moderate to strong lighting that has 350 to 550 nm for best absorption and 0 phosphates. They can be easily overtaken by cyanobacteria and algae. Avoid the Flamingo Tongue snail and snails form the Murex genus, as these corals will be eaten by them. While many other gorgonians are shown in this video, making it worth watching, the Splendid Knotted Fan Coral close up is amazing! Sadly this coral has a dismal record of surviving in even the most pristine aquariums. They need heavy feeding, which in turn pollutes the tank, fouling the water. These are best enjoyed by watching amazing videos such as these. There are other similarly colored gorgonians that do better in captivity. This video shows the various ways a Blue Coral can appear. Their polyps come out at feeding time and their "blue" coloring is actually inside the coral with more of a tannish skin. When they shed, they pull in their polyps and they slough off a layer of slime, similar to Toadstool Leather Corals. They like strong turbulent flow (not linear which can damage the polyps) and strong lighting. Moderate lighting can work, however they will have to be fed to make up for the lack of light. This beginner coral is a little odd ball that will be a joy to own! The Giant Orange Sea Slug, Tritonia diomedia, which is actually a nudibranch preys on the Fleshy Sea Pen. As you can see the Sea Pen reacts by pulling itself tightly into a ball. They need a 4" sand bed to sink their "foot" into and feed at night. Feed them regularly with zooplankton and other high-protein foods that are of small particulate size. Letting go and "floating" may be okay in the wild, though in captivity, this can lead to a disastrous end! They are best left to advanced aquarists. The Green Star Polyp, or as many call it, GSP, are easy to care for. They are best kept in a 50 gallon tank or more and they like bright lighting, however they can tolerate less light with supplemental feedings. They like moderate to high water movement, and will not do well in slower waters. Lysmata or Saron Shrimp will feed on them and certain species of algae will grow over them. Corky Sea Fingers need a few things to stay alive and healthy in captivity. The tank should be 50 gallons at least and 24" or deeper. If there will be other corals, protect them from your spreading gorgonian by making a "rock island" in the middle of the sand. Also use media to help keep their toxins under control so they do not kill other corals. Corky Sea Fingers do need decent water quality, moderate turbulent water movement, temps between 68 and 75˚F (20 to 24˚C) and moderate to strong light. Fish waste will add to the nutrients they take from the water as well as stirring the sand and at times, feeding live phytoplankton. Some aquarists say they do not need food, just strong light, however with moderate light, they may need some very tiny particulate foods. Cabbage Leather Coral, Lobophytum sp. This leather coral is one of over 40 species in the Lobophytum genus. They have fully retractable polyps and this genus has a short wide low stalk and has folds across its upper surface that are crowded planted or fingerlike. The shapes of this genus can be bowl, dish or upright and shed mucus that should be kept off of other corals. Moderate light and moderate water flow and good calcium levels will help this coral grow quickly. Feed them foods that filter feeders eat. What are Octocorals? Sometimes Octocorals are loosely dubbed "soft corals", but that's not quite right. These corals are softer than stony corals, and most do not really contribute to reef building. But most do have calcium, or aragonite, in their system. Rather than creating larger skeletal masses, most of these corals have teeny little skeletal pieces buried inside, called spicules or sclerites. On some the spicules are used to build tiny internal support-type rods and others use them to anchor to the substrate. The spicules are also used at a microscopic level to help identify the different species. Though not adding hard structure to the reef these spicules do add large amounts of sediment. The Octocorals do have a few quirky exceptions to the above. Two corals with larger calcareous structures are the Blue Coral Heliopora coerulea, which has a blue skeleton, and the Organ Pipe Coral Tubipora musica with a red skeleton. Another quirky group are the Gorgonians in the Suborder Holaxonia. Rather than calcium, they have a protein based, flexible material that contributes to their structure. It is similar to the horn material of a mammal, thus leading to the alternate names of "horn corals" or "horny corals". Only one Octocoral species exists as a solitary polyp. On all others the surface is a soft matrix, known as the coenenchyme. This membranous mat is embedded with spicules and a series of interconnected canals used for nutrient flow and water movement throughout the organism. The polyps are embedded in this surface as well. On many Octocorals the polyps may be housed within little bumps raised up on the surface, called calyces. The polyp's stalks are topped with a mouth that is surrounded by eight feathery tentacles. Some species have their polyps localized in particular areas as well, which are referred to as the capitulum, polyparium, or more commonly the "head'. The variety of colors found in Octocorals are the result of a couple different factors. Those that have zooxanthellae living in their tissue can gain color from this marine algae, and they are commonly brown or green. Other colors come from embedded sclerites which can have a pigment incorporated in them. These are acquired through the soft coral's feeding. The color resulting from zooxanthellae is not permanent, but color acquired through the sclerites is. As with all Cnidarians these organisms have a complex life cycle. They have both a motile phase and a sessile phase. During the motile phase they are free swimming and planktonic. Later when they settle onto a substrate and develop they are considered sessile. In the sessile phase some Octocorals release gametes into the water column to be fertilized while others fertilize internally, releasing larvae into the water column. Some species, like the Xenia and Anthelia corals, will also multiply asexually, usually by budding. Beginner Aquarium Soft Corals Many of the Octocorals are quite hardy and some of the easiest corals to keep. A beginner aquarium soft coral will grow into a beautiful, impressive specimen in the reef tank. These are very commonly available and considered to be some of the best beginner corals. Despite their great track record in the aquarium, be aware that all Octocorals produce toxins. Like other corals, these toxins can be released to ward off competition for space. Some are highly toxic while the toxin others produce can be very minimal. The impact of these toxins is often reported as aquarists find their stony corals receding when kept with too many, or in some case, any soft corals. Excellent filtration with foam fractionators (protein skimmers) along with activated carbon can help to remove and control some of the toxin. But Octocorals are best kept in a tank dedicated to softies, or in a very minimal mix with other corals, depending on the type and space available. Coral Care Like the stony corals, the Octocorals obtain their nutrition from multiple sources. They capture planktonic organisms and microscopic food particles from the water column and can absorb dissolved organic matter. Some species receive nutrients through a symbiotic relationship with marine algae, known as zooxanthellae. Because Octocorals have far fewer stinging cells than most other types of corals, they rely on capturing small prey from the water column. They primarily feed on microplankton, filtering the water through their feathery tentacles to ensnare tiny food particles and then retract to pull the prey in. The polyps can completely retract into the surface. It is common for Octocorals to change forms, even within a single species, to adjust to different water flows and types of prey. Extending and retracting to capture prey can create an interesting pulsing type action. This is especially notable in the Xeniidae family, as is commonly seen in the popular "Pulsing Xenias". The Alcyonacea order has a number of very diverse suborders. Included in this order are the Soft Corals, Leather Corals, Gorgonians (sea fans and sea whips). 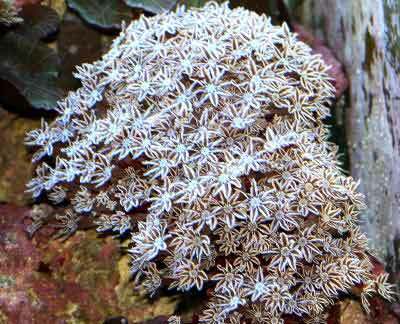 The Alcyonacea corals are distributed worldwide, though primarily in tropical waters. They typically occur in intertidal zones at depths of 50' - 80'(15 – 25 m). They have a number of growth forms ranging from arborescent to finger-like, branched, or lobed. The Soft Corals are primarily colonial sessile animals, with the exception of members from the Xeniidae family, meaning they are anchored firmly to the substrate. Like all Octocorals, their surface is covered with a soft membranous matrix. The entire surface is covered with relatively small polyps, each with eight pinnate tentacles and eight septa used to gather food. The texture of these corals is leather-like to fleshy. The Soft Corals tend to be sticky while the Leather Corals tend to be more leathery. They abound in all the colors of the rainbow, though the hues of yellow, orange, red, olive, rust, and purple are most predominant. Like the Soft Corals, the Gorgonians are colonial sessile animals. They form colonies that are generally erect, but can be encrusting. Gorgonians are come in a great variety of shapes from flattened and branching fan-like forms to whip-like, feathery, and pinnate. Pinnate is where two branches interconnect into a mesh. Similar to the Sea Pens in the order Pennatulacea, they can also be bushy. Gorgonians have a tough, yet very flexible central axial rod that is covered with a living surface called a rind. The axial skeleton of those in the suborder Holaxonia is composed of a fibrous protein substance, known as gorgonin. It is similar to the horn material of mammals. Thus the common names, Gorgonian, Horn Coral or Horny Coral, are derived from this substance. Those in the suborder Scleraxonia are calcium based like other Octocorals. Their central stem attaches to the substrate with the delicate branches radiating outward. They not only attach themselves to hard surfaces, but also are also capable of anchoring to soft bottoms with root-like runners. Most are very colorful in shades of yellow, orange, and red. The color can be permanent in those of the suborder Scleraxonia that incorporate pigmented sclerites within their structure. There are quite a number of families in the Stolonifera order, including the family Tubiporidae that has the well-known Organ Pipe Coral Tubipora musica. Like the Blue Fire Coral Heliopora coerule, this is a type of Octocoral that calcifies an external skeleton. Tubipora colonies are massive, and formed by parallel tubes connected on horizontal platforms. These tubes are actually sclerites. On these corals the sclerites are fused to form the skeleton rather than being a calcareous skeleton like that found on stony corals. Mat Polyps are found throughout the Indo-Pacific and are in common shallow coral reefs with a calmer water flow. The Organ Pipe Coral has a distinctive skeleton that is a beautiful bright or dark red color. Its beautiful skeleton is usually hidden however, when its polyps are extended. The Blue Coral or Blue Fire Coral Heliopora coerule is classified in the order Helioporacea, under the family Helioporidae. It is one of only two types of Octocorals that calcify an external skeleton. The other is the Organ Pipe Coral Tubipora musica in the Tubiporidae family. The Blue Coral colonies can be arborescent or plate-like. They form a matrix of fibrocrystalline aragonite corallites that are connected by runners, called stolons. Externally they are white, however they get their name from the gorgeous blue color of their skeleton. The permanent blue coloring is usually only visible when rough seas have broken off pieces of the coral. Underwater they look much more like the Hydrocorals in the Millepora genus commonly known as Fire Corals. There are around 300 species of Sea Pens or Sea Pansies. They live at many depths from shallow waters down to deep seas. Sea pens can be fleshy or filamentous, and can expand to great length and size by pumping water into their gastrovascular cavities. Sea Pens share many characteristics with Soft Corals, but there are differences too. The biggest difference is in their habitat. While a Soft Coral will attach to hard substrates, the Sea Pens anchor themselves with their bulb-like shape into deep soft bottoms like sand or mud. They can also easily free themselves and move around. During the daylight hours Sea Pens usually bury themselves into the sand, and emerge at night to capture plankton. Each colony is either male or female, though females are usually predominant in nature. Many are very attractively colored due to pigmentations within their calcareous bodies, and many will luminense in the dark. Octocoral Taxonomy The systematic classification of members of the Subclass Octocorallia is highly complex. It contains quite a diverse group, and like most corals they are considered poorly understood and understudied. The current taxonomy is under constant flux, with maybe about half presently known, and of those most are only identified down to the genus level. For example, the Gorgonians have been moved between Suborders and the Blue Coral and Sea Pens have been moved about from order to order. So it is to be expected that classifications will continue to change. In fact many experts are in favor of a complete revision. Different sources may show some categorization differences.